Dow Debate: Will Pfizer Crush Merck? Pfizer and Merck disappointed in 2013 but have made encouraging starts to 2014. Can Pfizer beat Merck, or vice versa? Merck (NYSE:MRK) and Pfizer (NYSE:PFE) had challenging years in 2013, with both stocks being outperformed by the S&P 500. The broad-based market index delivered a total return of 26.4% over the course of the year, comfortably beating Merck's 25.6% and Pfizer's 22.2% returns. 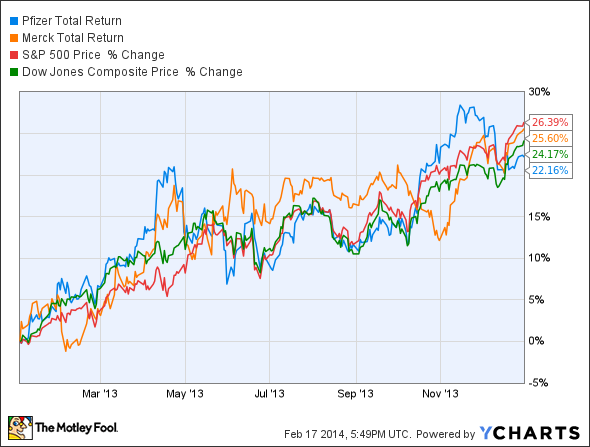 The first six weeks of 2014, though, have seen the two drugmakers beating major market indices. While the S&P 500 is down 0.5% and the Dow Jones Industrial Average down 2.5%, Merck and Pfizer have delivered respective share price gains of 10.8% and 4.3%. While Merck is comfortably outperforming Pfizer in the first part of 2014, what is the potential for a role-reversal in the pharmaceutical rivalry? Let's see. Latest earnings results showed that both companies experienced declines in sales and profits in the fourth quarter, due significantly to competition from generic drugs. Interestingly, Pfizer topped Wall Street expectations with its results, while Merck was only slightly below forecasts. However, both companies' fourth-quarter figures were still well below those recorded in 2012, with Merck's net profit falling by 14% and Pfizer's by 59%. There is no sign that challenges to the two companies from generic competition for formerly blockbuster drugs is about to disappear. Generic versions of Merck's Vytorin and Zetia (which respectively had total sales $1.6 billion and $2.6 billion in 2013) are expected to be available from 2014 and 2016. Pfizer is expected to face generics for Celebrex and Viagra (total respective sales in 2013 of $2.9 billion and $1.9 billion) by the end of this year and by 2020, respectively. Clearly, generic competition looks set to have a major impact on both companies in the coming years. However, when considering the pipelines for the two companies, Pfizer looks set to be hit the harder of the two over the next couple of years. While Merck's net profit is forecast to tick upward, from roughly $13.5 billion in 2013 to $14.5 billion in 2015, Pfizer's net profit is expected to fall from about $21 billion to $20 billion over the same time frame. Still, 2014 has seen encouraging news on Pfizer's pipeline, with the company recently reporting that its experimental drug for advanced breast cancer, palbociclib, hit its midstage study goal. Meanwhile, a pneumonia vaccine, Prevnar 13, could ultimately receive regulatory approval for use in adults aged over 65 (it is already approved for children and adults below the age of 65). These two drugs could contribute more than $4 billion in annual sales and help Pfizer to turn its bottom line around. Meanwhile, Merck's pipeline continues to show strength, with the company recently reporting a number of encouraging developments. Notably, Merck has announced several collaborations to evaluate novel combination regimens involving its immunotherapy lambrolizumab and initiated a phase 1 study with the drugs in 20 new cancer types. Pfizer is forecast to grow its dividend per share by 24% over the next two years, which makes Merck's growth of 5.8% over the same time period seem rather pedestrian. Both companies easily beat the S&P 500 yield of 1.96%, with Pfizer's yield at 2.7% and Merck's slightly higher at 3.1% (all TTM). However, should prices stay where they are, Pfizer's higher growth rate in dividend per share should see its yield beat Merck's over the medium term. Both of these figures are in line with sector peer Bristol-Myers Squibb, which offers a yield of 2.6% and is forecast to grow its dividend by 5.2% over the next two years. This company also faces generic competition but is moving ahead with an exciting pipeline of drugs, as it seeks to move from mass-market manufacturer to a niche, specialist player. Bristol-Myers Squibb has underperformed Merck and Pfizer in 2014 (its stock is up 2.3%) but, like its peers, has beaten the two major indices. When it comes to share price, it seems unlikely that Pfizer will be able to crush Merck during 2014. That's not to say, of course, that Pfizer won't do well -- the challenges from generic competition seem to be priced in and there is considerable potential in its pipeline. It's just that Merck could do equally well (if not more so) for the same reasons, plus it should see net profit growth while Pfizer sees net profit decline over the short to medium term. Both companies could continue to outperform the S&P 500 and the Dow in 2014, but neither is likely to deliver a crushing outperformance of the other. That's unless, of course, there is major positive (or negative) surprise concerning one of the companies' pipeline during the year.